This is the total number of profanity incidents in this 400 page book. “A big, blowzy romp through the rainbow eccentricities of three generations of crazy bayou debutantes.” —Atlanta Journal-Constitution “A very entertaining and, ultimately, deeply moving novel about the complex bonds between mother and daughter.” —Washington Post “Mary McCarthy, Anne Rivers Siddons, and a host of others have portrayed the power and value of female friendships, but no one has done it with more grace, charm, talent, and power than Rebecca Wells.” —Richmond Times-Dispatch The incomparable #1 New York Times bestseller—a book that reigned at the top of the list for an remarkable sixty-eight weeks—Rebecca Wells’s Divine Secrets of the Ya-Ya Sisterhood is a classic of Southern women’s fiction to be read and reread over and over again. 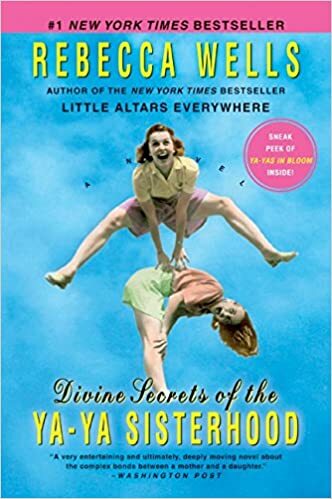 A poignant, funny, outrageous, and wise novel about a lifetime friendship between four Southern women, Divine Secrets of the Ya-Ya Sisterhood brilliantly explores the bonds of female friendship, the often-rocky relationship between mothers and daughters, and the healing power of humor and love, in a story as fresh and uplifting as when it was first published a decade and a half ago. If you haven’t yet met the Ya-Yas, what are you waiting for?